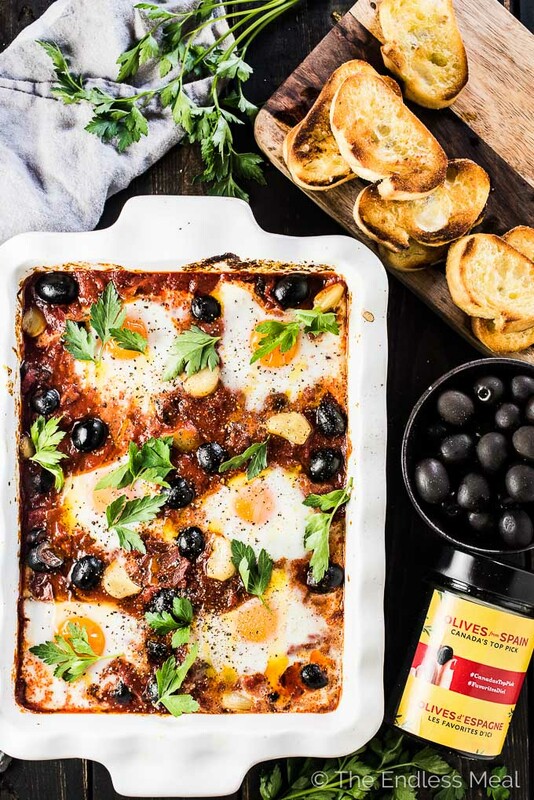 Spanish Baked Eggs is made with a rich tomato sauce with whole cloves of roasted garlic and lots of plump, black Hojiblanca Olives from Spain. 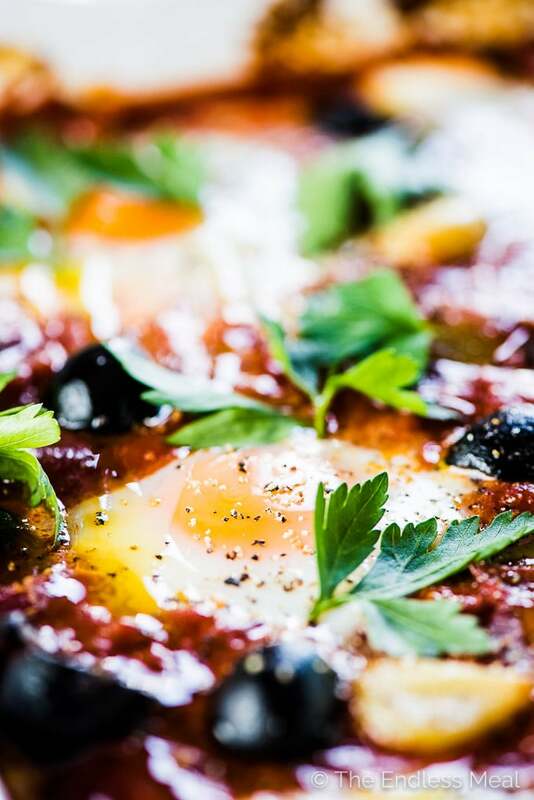 Eggs are baked into the sauce which is just as delicious eaten for dinner as it is for breakfast. Good morning, my friends! I've got one of my favorite breakfast recipes to share with you today. We love it so much that we'll sometimes eat it for dinner, too. 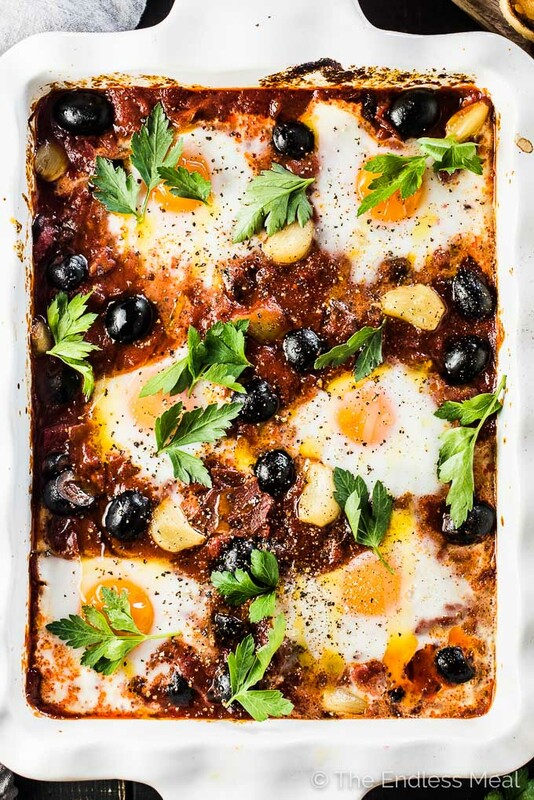 This Spanish baked eggs recipe with Hojiblanca olives from Spain is similar to shakshouka. I guess you could call it a Spanish shakshouka recipe. The eggs and Hojiblancas are poached in a rich and flavorful tomato sauce that is absolutely delicious. The tomato sauce is everything. There are layers of flavor from the caramelized onions and tomato paste to the roasted garlic and red peppers. We often add some Jamon Serano (aka: Spanish ham) but will sometimes leave it out for a vegetarian version. Loads of Hojiblanca Olives from Spain. These babies are black and have a mild flavor which works really well in this recipe. I like to have extra on hand cause I always end up snacking on some as I cook. Roasted garlic. I know we've already talked about this with the sauce, but it's good enough to warrant its own point. There are two full heads of creamy, delicious roasted garlic in these Spanish baked eggs. Bring it on! Savory breakfasts are the best and this one is as savory as it gets. 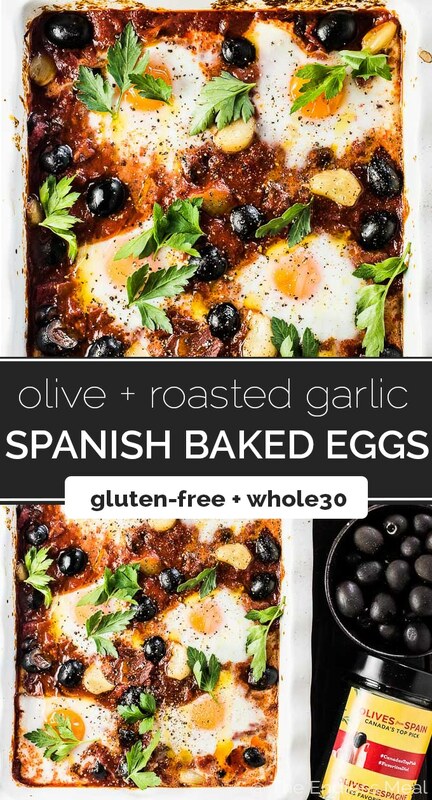 In this Spanish baked eggs dish, I decided to use Hojiblanca Olives from Spain. They're one of my favs. Their name means “white leaf” in Spanish and it references the silvery shade of the tree's leaves. It is fairly large, plump, and ranges in color from deep purple to black. Most importantly, it's delicious! The mild flavor makes them really easy to cook with as they work well in many recipes. Even my two-year-old daughter loves to eat them! It's a good thing as Olives from Spain are really healthy. Fun trivia fact: did you know that 1 out of every 2 olives eaten in Canada is Spanish? Bring on all the Olives from Spain! And bring on the roasted garlic. Do you guys love roasted garlic as much as I do? I could eat it spread thick on a piece of toast and call it dinner. Did you see that picture up there? That is what the sauce should look like before you add the tomatoes. It's dark and rich and has so much flavor. 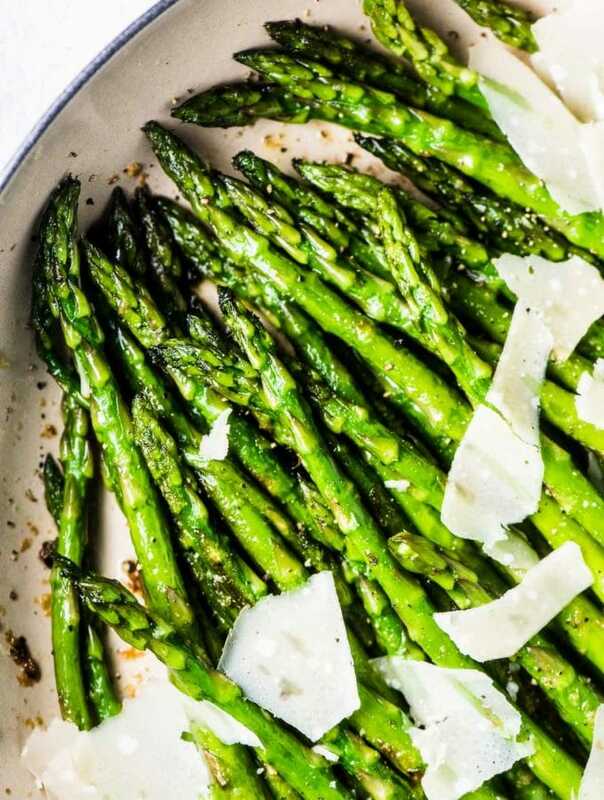 → Start by cutting the tops off of two heads of garlic and pouring a little olive oil over the top. Pop the garlic in the oven. → Next you'll saute the Olives from Spain with the onion and pepper until the onion is caramelized. 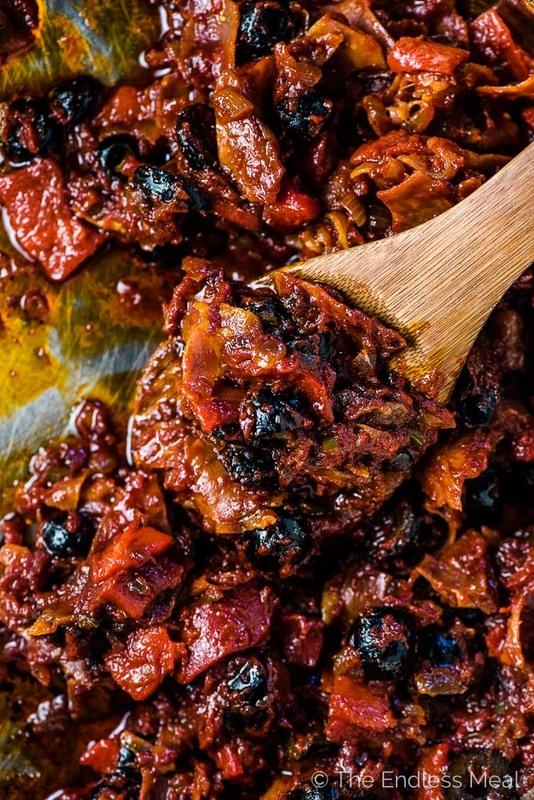 → Here's the important part: add the tomato paste and let it caramelize. Letting it get dark and fragrant gives tons of extra flavor to the sauce while taking only 4-5 minutes of your time. It's worth it. → To finish the sauce, all you have to do is add the spices, canned tomatoes, and roasted peppers and let them simmer for a few minutes. → Once you've made the sauce, you'll stir in the roasted garlic and nestle in the eggs. 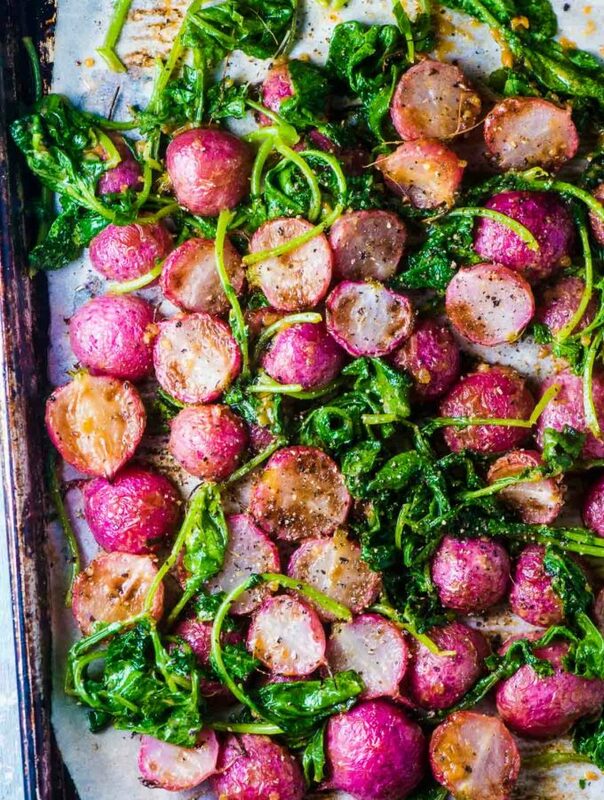 Pop it in your oven for a few minutes to let the eggs set and you'll be ready to eat! Roughly chop the Hojiblanca Olives from Spain and add them to a large frying pan with 2 teaspoons of the olive oil. 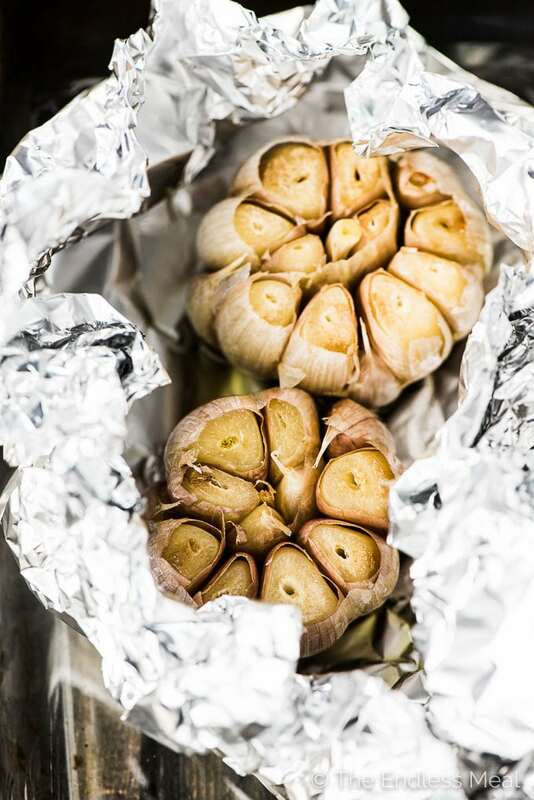 Place the garlic cloves in a piece of aluminum foil and drizzle with the remaining teaspoon of oil. Place the garlic in your oven and turn your oven on top 350 degrees. Add the red onion, serrano pepper, and (if using) the Jamon Serano to the frying pan and cook on medium heat for 5 minutes. Push the ingredients to the side of the pan and add the tomato paste. Let it cook, stirring occasionally, until it has darkened and smells sweet, about 4-5 minutes. Add the Spanish paprika, salt, roasted peppers, crushed tomatoes, sherry vinegar, and honey to the pan and bring to a boil. Simmer for 10 minutes. Remove the garlic from the oven and let it cool slightly. Squeeze the cloves from the skin and add them to the tomato sauce. Transfer the tomato sauce to an ovenproof baking dish then crack 8 eggs and nestle them into the tomato sauce. Put the baking dish in the oven and bake until the egg whites are set, about 6 minutes. If you use an ovenproof frying pan, you can cook the eggs in the pan rather than transferring them to a baking dish. i only eat scrambled eggs. how can i make this with scrambled eggs instead? i like the idea of them in with this amazing sauce. scramble and add them before baking? I would make the sauce and then serve the scrambled eggs on top. No need to bake it! 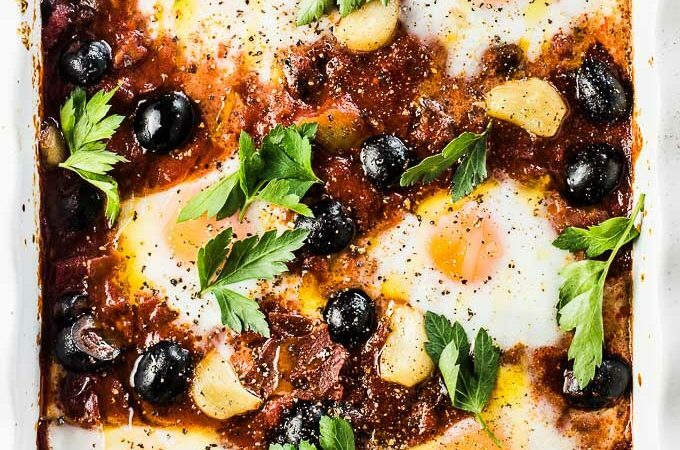 This is the best baked eggs recipe ever! I’ve tried quite a few and this one wins. We made the vegetarian version but with all the olives and roasted garlic there was tons of flavor. Thank you for another great recipe! 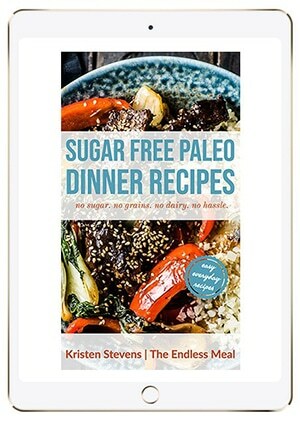 I’m so happy to hear the recipe was a hit!!! I am so going to make this for an appy this weekend…..lv the olives and caramelized onions. I hope you like it as much as we do!! Oh my gosh, this recipe is making me drool. I absolutely adore Spanish flavours and this recipe is ticking all of the boxes for me. All of those caramelised veggies in the sauce look amazing, never mind all of that roasted garlic 😍 I definitely need to try this! Caramelizing the veggies give is so much more flavor. It’s a great trick! I hope you love it as mich as I do! !